Although I like to do my share of experimenting in the kitchen, you’ll never hear me claim to be on the cutting edge of cooking or food trends. Even still, I suffer a bit of pique when I finally get around to making something that many others have already blogged about, and it’s so good, and seems like the most obvious thing in the world that I wonder why the heck it took me so long to try it. I hesitated a bit to write about this salad since it’s kind of reaching a saturation point in the foodblogosphere. But then I figured if it’s new to me, it’s likely there are those among you who still haven’t had it, and it really is so worth trying, bandwagon be damned. 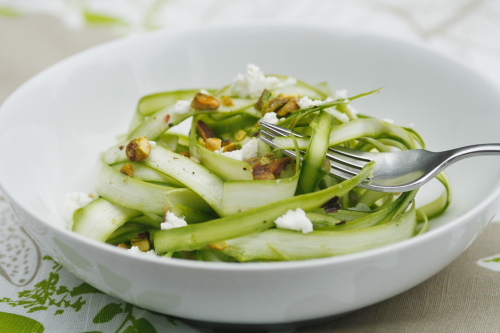 Although a current trend, shaved asparagus salad is far from cutting edge- I found a recipe for it in a Chez Panisse cookbook (I believe it was this one), so it dates at least from the ’90s if not before. But it certainly seems to be enjoying a bit of a moment right now. I think my initial pause, if you could call it that, was in the fact that I assumed (wrongly) that raw asparagus would have more of the slightly stinky, bitter edge than cooked asparagus does. I say this as an asparagus lover, mind you, and a fan of most all green vegetables. But I never felt a particular urge to try asparagus uncooked as a salad, any more so than I would, say, cauliflower or okra or green beans. Until recently, that is, when we were on our third or fourth bunch of asparagus in just about as many days (I went a little nuts when the Michigan asparagus finally arrived, later than usual after the weeks of unseasonably chill weather). We’d had it roasted, steamed, stir fried and grilled, and it was time for something new. I got out my vegetable peeler and got to work. When I had a bowl piled high with pale green tangles, I dressed it lightly with olive oil, lemon juice, salt and pepper. 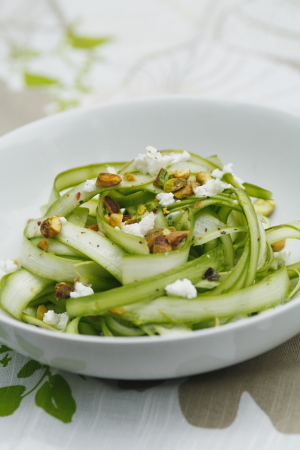 I crumbled ricotta salata on top, along with toasted, chopped pistachios whose hue echoed that of the asparagus ribbons. I am only slightly embarrassed to say that I hoovered the entire dish down in minutes, it was so good. The salad had a sweetness to it that I hadn’t expected, and none of the “raw-tasting” quality I’d subconsciously feared- at least not in a bad way. It tasted raw in the sense of fresh, light and healthy; just what you’d crave on a warm day. I made it again the next day and ate nothing besides that for my supper, polishing off the fat bunch of spears all by myself in what amounted to two oversize servings. I’m looking forward to playing around with asparagus salad as long as it’s in season- I figure I have a couple more weeks at least. I already have a sesame-ginger dressing in mind, and I’d like to try the Caesar treatment as well à la Sassy Radish (although I think for that, I’d slice it very thinly on the bias, since my peeler produces very thin slices that wouldn’t stand up to a heavier dressing). Have any of you made asparagus salad? What’s your favorite preparation? And if you haven’t made it yet, you must- now that I’m on the bandwagon, I’m recruiting passengers. It would be bold of me to call this a recipe, so I won’t; just think of it as a starting point for your own slurp-worthy creations. The quantities are all approximate and as always, you should rely on your taste buds. This salad will quickly become droopy as it loses its liquid when salted, so it is best only to make a quantity you think you’ll consume in one sitting (but trust me, that’s not hard to do). Rinse the asparagus and trim away or snap off the tough ends. Hold a spear flat against a cutting board with the tip in your left hand, and using a vegetable peeler, peel from left to right, leaving the tip intact, to create long ribbons of asparagus (reverse for left-handers). I found the easiest way to do this is to place the cutting board so that it slightly overhangs the counter, so you can get the peeler horizontal with the asparagus and get the proper leverage. Discard the first and last strips of each spear, which will be mostly peel. 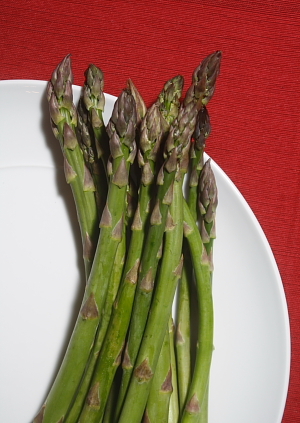 Repeat with all of the asparagus, reserving the tips for a risotto or omelette. Dress the ribboned asparagus lightly with olive oil and a generous squeeze of lemon; add salt and pepper to taste, tossing to distribute. Sprinkle the cheese and nuts on top and eat immediately, sharing only if necessary. So, I know it’s Christmas Eve and you’re all probably running around doing your last-minute preparations. 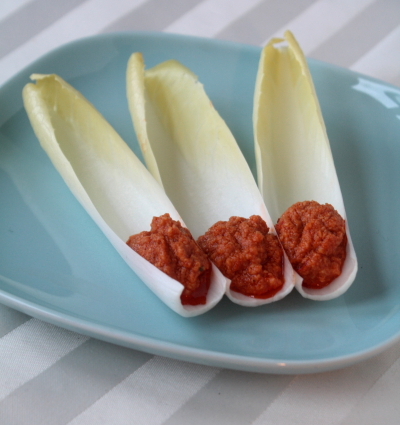 But I’ve been sitting on this post for a long while now and wanted to get it published- there’s a recipe for romesco sauce that you just might be interested in if you need a last-minute appetizer for a Christmas or New Year’s party. There ain’t no party like a Detroit… sherry tasting! Those of you who have been following this blog are familiar by now with the GU Detroit*, a loose collective of “food and drink professionals and serious enthusiasts”. 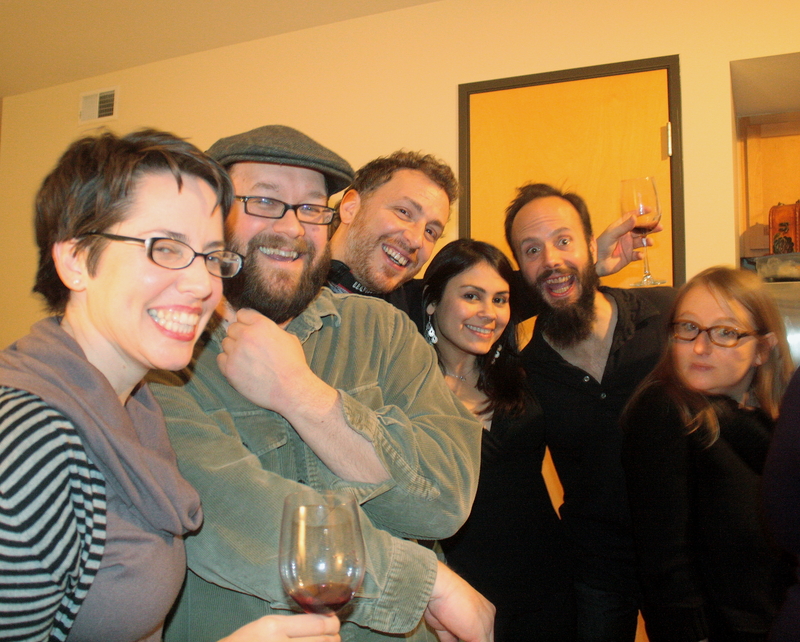 A couple months ago the topic of sherry came up in the forums, and since no one was extremely knowledgeable, and because we all love an excuse to get together and imbibe, our friend and cohort Suzanne seized the occasion to host a sherry tasting. *That’s “gee-you Detroit”, short for Gourmet Underground, not “goo Detroit”, in case you were wondering. The GU Detroit gang being what it is, I shouldn’t have been surprised to walk in and see a large table groaning with the weight of what seemed like several tons of food- Spanish charcuterie, cheeses, olives, and tapas of all sorts were nestled in tightly, and I was challenged to find room for my contributions. Although I should be used to this kind of spread at a GUD event, it was still a bit overwhelming and I had that “kid in a candy store” feeling for at least the first hour I was there. In addition to about 10 or 12 types of sherry, there were wines (including several bottles of Les Hérétiques, a GUD favorite that Putnam and Jarred turned us on to) and homemade cider my brother brought. The tasting was semi-organized in relation to the number of people there- someone (Evan or Putnam, I’m guessing?) had lined up the bottles in order from the pale finos to the darker, richer olorosos so that we could attempt some semblance of a proper tasting. However, due to the somewhat chaotic nature of the event, I can’t tell you much beside the fact that I preferred the lighter sherries; the intense raisiny flavors of the darker sherries were not as much to my liking. 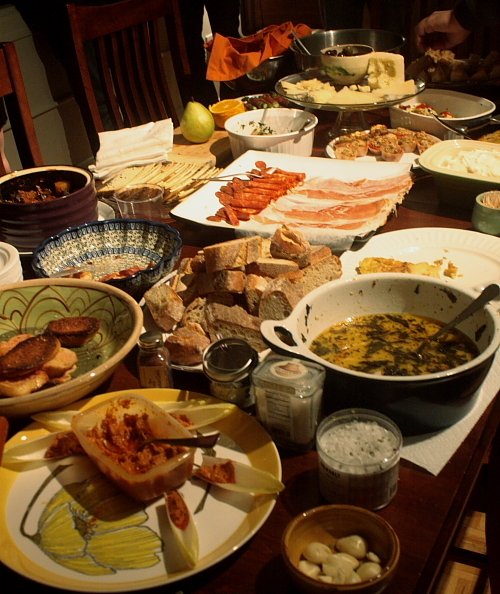 I hadn’t had a chance to cook for quite some time, so the day of the party I decided to go all out and make three different tapas to bring. Flipping through The New Spanish Table, I came across a recipe for deviled eggs with tuna (which I blogged about in a less breezy post than this) that sounded perfect. I also made a batch of romesco sauce from the same book, a paste (although that word makes it sound less appealing than it is) made from hazelnuts and peppers and garlic and sherry vinegar that can be eaten with crudites. Last but not least, I sauteed some button mushrooms with garlic and parsley. I think I’m at my cooking-mojo best at times like these- when I have the day to consecrate to the task, and an event to prepare for. I can’t wait for the next GU Detroit gathering, aka excuse for me to actually cook. I’m not anticipating doing much cooking to speak of in the next month (not counting lots of scrambled eggs/omelettes and salads for dinner), as I focus on packing and moving house and getting the new house in order, so unless there’s an event to kick me into gear it may be a while before you hear from me, at least regarding new recipes! But I’ll be around, regaling you with other food-related news and happenings. 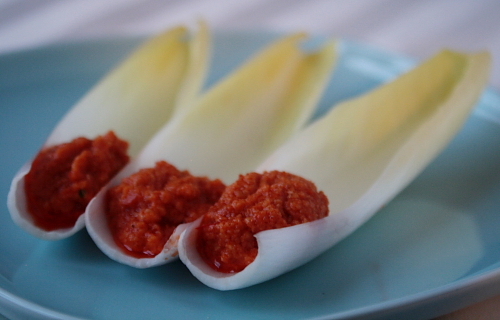 For now though, here’s the romesco recipe. If you’ve never tried it, I strongly encourage you to do so- it’s a nice break from all the roasted red pepper hummus and cheese spreads and ranch flavored veggie dips so prominent around this time of year. In addition to using it as a dip, it has other applications as well- in the Zuni Cafe Cookbook, Judy Rodgers cooks shrimp in it (I’ve made this too and it’s uhhh-mazing!!) and I can picture it as a great sauce for chicken too. Notes: I could not locate a ñora pepper or ancho chile when I made this last time, so I used something labeled “chile California” which, although inauthentic, worked fine. 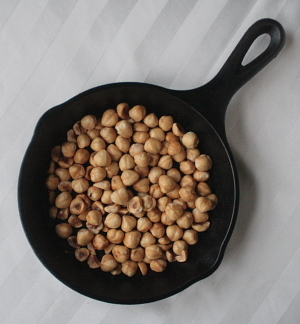 Also, almonds may be substituted for the hazelnuts, or a combination used. The sauce will have a slightly different character but will still be delicious. 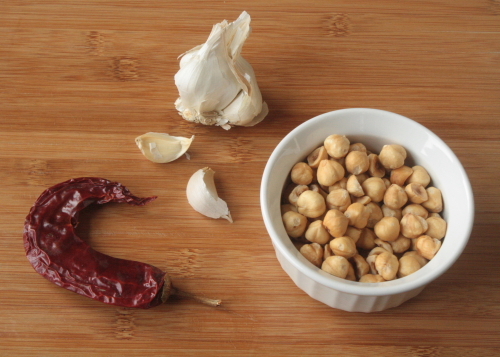 If you want to gild the lily, fry the nuts in olive oil instead of dry-toasting them. Soak the dried pepper in very hot water until softened, about 30 minutes. Remove and discard the stem and seeds and tear into small pieces, either before or after the soaking, whichever is easiest. Reserve the soaking liquid. Place the nuts in a food processor and pulse a few times until roughly chopped. Add the garlic, pepper, paprika, tomato, breadcrumbs, cayenne and ⅓ cup of the pepper water and pulse until fairly smooth but retaining some texture. With the motor running, drizzle in the olive oil, processing until completely incorporated. Scrape the contents into a clean bowl, stir in the vinegar, and season with salt to taste. Cover and let sit for at least 30 minutes at room temperature for the flavors to meld, then taste and season with more salt or vinegar as necessary. Serve with crudités such as endive leaves, fennel or celery sticks, or use as a sauce for grilled shrimp, chicken or asparagus. A few months ago I got an email from a gentleman at Oh! Nuts asking if I’d like to sample some product, and maybe I could write a recipe about it. I was thinking of all kinds of treats to make- ice creams, tarts, etc. But when the package came, I was too busy to do anything with it so I made like a drag queen and tucked the nuts away. 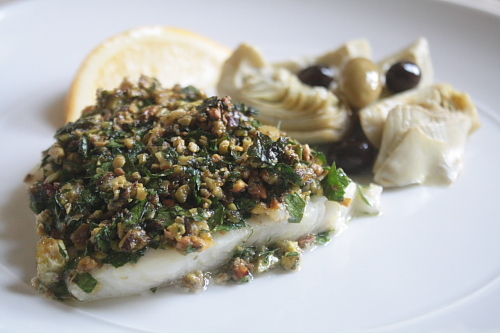 Then recently I checked out A16: Food + Wine from the library (yes I know, I’m behind the curve on this book that was much-hyped around Christmas 2008) and saw a recipe for halibut with a pistachio, parsley, and preserved lemon pesto (try saying that three times fast!). 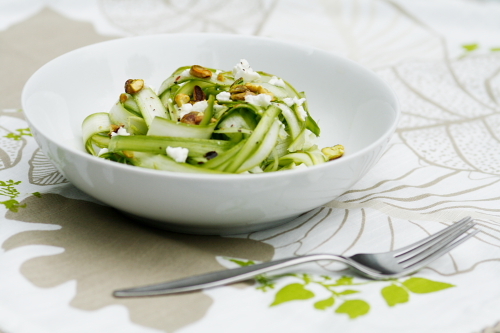 It sounded like a perfect summer dish and a great excuse to use some of those pistachios. I was really happy about how this recipe turned out, and although I made it with fish, I could easily imagine this pesto-like sauce as an accompaniment to roast chicken or on pasta for a vegan dish. As a side dish, I just drizzled some artichokes with olive oil and lemon and tossed a few olives in for good measure. I picked up a nice bottle of Auratus Alvarinho selected by Jeffrey at Holiday Market that was moderately priced and a great compliment to the food; A16 suggests a Sicilian Carricante if you can find that. As far as a “review” of the nuts, they were perfectly fine, fresh, etc. Of course I always advocate buying local first, but if you can’t find something you need, the Oh!Nuts website is a good alternative. A note on fish: To find out whether a certain fish is on the endangered/ unsustainable list, check here. Re: substituting fish, Mark Bittman’s book Fish: The Complete Guide to Buying and Cooking is an excellent resource; for each type of fish, he lists several other species which can be interchanged in recipes. Note: This pesto is best served the day it is made. 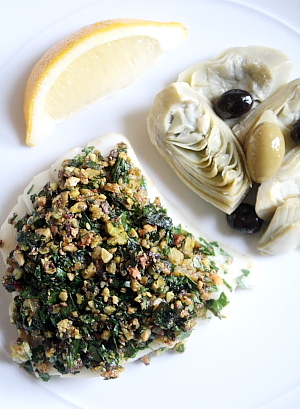 Soak the capers and preserved lemon peel in cold water to remove some of the salt. Roughly chop the parsley. Put it in the bowl of a food processor (if you have a smaller-sized bowl, this works best) along with the pistachios, chili flakes and capers (drained and rinsed). Pulse while adding the olive oil in a thin stream, scraping down the sides once or twice, until the pistachios are well-chopped. 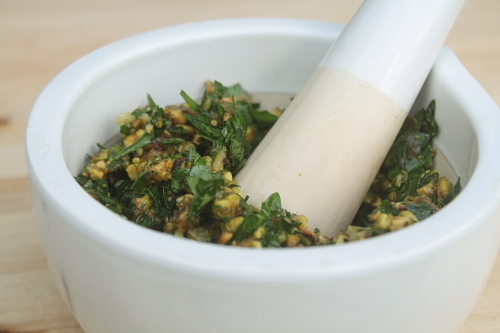 Alternately, you can make the pesto in a mortar and pestle; you’ll want to chop the parsley more finely for this version. For fish or chicken, I prefer a looser pesto where the nuts are left slightly chunky, but for pasta you could process it a bit more if desired. 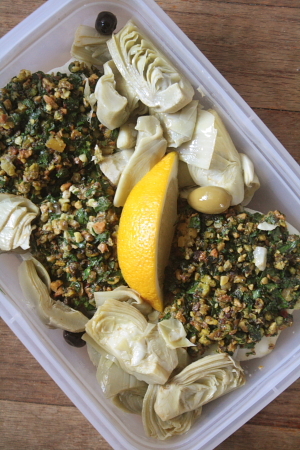 Finely dice the preserved lemon peel and stir into the pesto; taste for salt (mine did not need any; the capers and preserved lemons were salty enough to season the mixture). To serve with pasta, simply toss the pesto with 1 lb pasta that has been cooked in well-salted water. Drizzle over a bit more olive oil if desired, and serve with fresh lemon wedges. Note: The A16 recipe calls for halibut, but at $19 a pound it was a bit out of reach for me so I substituted cod. The cod was thinner but I folded under the thinnest ends to ensure a more even cooking, and adjusted my cooking time downward. Season the halibut fillets with sea salt at least one hour and up to four hours prior to cooking. Remove from refrigerator ½ hour before cooking to allow to come to room temperature (less time will be needed for thinner fish). Preheat oven to 400°. Drain off any liquid that has accumulated and place the fish in a glass baking dish. Divide the pesto evenly among the fillets, pressing down so it adheres. Place a small amount of water in the bottom of the dish, enough to come about a third of the way up the fish. Cook for 10-15 minutes or until the fish is just cooked through; this will depend on type and thickness of fish, so keep a close eye on it. (Fish is done when it is just firm to the touch; it will continue to cook for another couple minutes after removed from the oven, so it’s best to err on the side of ever-so-slightly underdone.) Drizzle with a bit more olive oil. Taste the braising liquid and drizzle some of this on top if desired. Serve immediately with fresh lemon wedges. I’m not usually the type to make a recipe more than once or twice, even if it’s really great, because there are so many new things to try and I always have a backlog of recipes I want to make. It’s kind of like reading the same book twice… I’ve done it before, but I’d much rather take a chance and read something new! 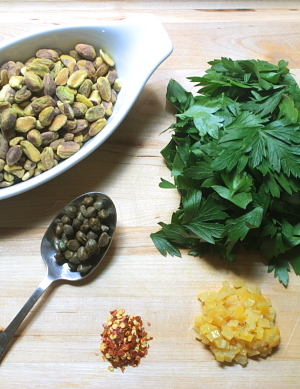 Notes: When I made this, I only used the tarragon and parsley. For those of you who have herb gardens or unlimited grocery budgets, by all means use the chives and chervil; however, where I live, fresh herbs run at least $2 a package and I’m certainly not suggesting they’re crucial enough to justify that expense. If you’re leaving them out, I would up the parsley and tarragon to 1 1/2 tbs each, though. Spreading the potatoes on the baking sheet may seem like an extra unneccesary step, but it really helps get the dressing much more evenly distributed than just stirring, so you don’t get bland bites of potato with no sauce. Last but not least, in the photo, those are scallions you see… I couldn’t locate the shallot I *knew* was hanging out somewhere in the kitchen, so I improvised. But shallots would definitely be my preference. Directons: Place the potatoes in a large saucepan with 6 cups cold tap water and the 2 tbs. salt; bring to boil over high heat, then reduce to medium. Lower garlic into the simmering water via a skewer or slotted spoon, and blanch for about 45 seconds. Run the garlic under cold tap water to stop the cooking, and set aside. Continue to simmer potatoes, uncovered, until tender but still firm, about 5 minutes. Drain potatoes, reserving 1/4 cup of their cooking water. Arrange hot potatoes on one or two rimmed baking sheets close together in a single layer. Mince the garlic or put through a garlic press. In a small bowl, whisk together the oil, vinegar, reserved potato cooking water, garlic, and a few generous grinds of pepper. Taste both potatoes and dressing for salt, adding a little to the dressing if it seems bland. Drizzle the dressing evenly over the warm potatoes and let stand for 10 minutes. You can use this time to mince your shallots and herbs. Sprinkle the shallots & herbs over the potatoes. Transfer to a serving dish. Mix gently with a rubber spatula to combine. Serve immediately. (The salad is best served slightly warm or at room temperature. If your schedule prohibits serving it right away, remove the salad from the fridge long enough in advance to allow it to come to room temp, and wait to add the herbs until just before serving.) According to Cook’s Illustrated, the salad is safe to sit out unrefrigerated for 2 hours. As usual, I left this month’s Daring Bakers challenge until the last possible minute! Fortunately, it was a pretty easy one to throw together. We made a Bakewell Tart, which I am to understand is a classic British dessert (or “pudding”, as they say across the pond). It’s basically a pastry crust with a layer of jam spread on top, filled with a batter of eggs, butter & ground almonds (aka frangipane). Thanks to the help of my food processor and stand mixer, I was able to put this together Thursday after work and before band practice. (I went up north Friday, so had to have it done before we left.) Fortunately, the intense heat of the past couple days subsided just in time for me to heat up my kitchen with a 400-degree oven! The results of my tart were somewhat mixed. It’s hard to say if it was successful since I’ve never tried or seen one of these with the exception of looking at other DBers’ photos, but the first thing I noticed was that my frangipane didn’t puff up whatsoever; it was fairly dense. Also, the quantity of pastry crust called for seemed much more suitable to a 10 or 10.5″ tart pan rather than a 9″ (I used the whole quantity as specified, and ended up with a pretty thick crust that didn’t fully cook through). Perhaps I would have had a better result if I had cooked the tart 5 minutes or so longer, but the top looked slightly browned and felt firm so I thought it was done. However, my crust ended up pretty pale. I don’t want to call the result a “fail”, but it just wasn’t to my taste. I’m not a fan of baked goods that seem so moist that you feel you’re almost eating raw batter (I can’t stand doughy cookies or overly “fudgy” brownies), and this tart was verging on that texture. I was, however, quite pleased with the flavor combination I chose. I used apricot-orange preserves from Trader Joe’s for the jam, and the flavors of the fruit paired brilliantly with the almonds. Verdict: If you’re a fan of almonds, and are looking for a fairly easy dessert recipe to put together, I would give this a go. You may just want to bake it a little longer, or possibly add another tbs of flour if you prefer a less damp texture. Also, the ground almonds I used were not skinned, so perhaps that’s why my tart had a denser texture (although the recipe did not specify skinned ground almonds). I think skinned almonds would have lent a more refined appearance and possibly allowed the frangipane to puff up more. 6/29 Update: I went away for the weekend and stuck the remainder of my tart in the fridge; I had a piece today, cold, and liked it much better! The texture was more like a firm bar cookie rather than a squidgy undercooked tart.